THIS ARTICLE CONTAINS A WALKTHROUGH FOR ZEBION. WE WILL UPDATE THIS AS WE GO ALONG. 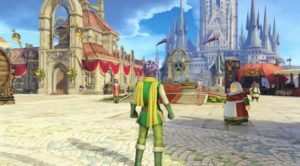 This page contains a walkthrough on the main quest Accordia in Dragon Quest Heroes II. Most of the terms here are based on the Japanese version of the game, so some terms may not be translated clearly. We will be updating this when the English version of the game comes out in April 25, 2017. Talk to the nun and you will receive an item. Go to the area where there is a bar. Talk to Desdemona then head to the tower. Go to some facilities in Rueda and you will be able to change jobs. Talk to the chemist to get alchemy items. Go to the quest center so that you can partake in sidequests. Go to the area where you can get prizes. Speak to the “subjugation reporting place”. Talk to the teacher and learn a skill. Take a quest when you talk to a soldier at the city square. Take a quest when you talk to the blacksmith’s uncle. Go to where the audience gathers. Queen Cretia gets the “crystal of energy”. Take a quest when speaking to the blacksmith. Go to the orb store and pick a blank space in the purchase list to add a quest. Once you talk to the aunt to the south of the area, a quest will be taken. Talk to the woman between the church and the bar in Rueda and you will receive another quest. Head to “The Ruins of Light” in Gaiyar. Travel to “The Desert of Darkness”.